Purpose: Use this document as a reference to rollover third party contracts in ctcLink. Select the Add a New Value tab to create a new Run Control ID, enter a value and click Add. If you have previously run the process, select Find an Existing Value and click Search and select an existing run control ID. Select the Term of the contracts you are rolling over. If you wish to copy all contracts for a specific Organization, enter the External Org ID. Leave the field blank to select all active contracts for the given term. Select Contract Type of Term. Enter the New Term - this is th term you will be copying the contracts to. Enter the Last Date that new charges can be covered or new students can be assigned. The system will use this value as a default for the new contracts that the rollover process creates. Select Use Cross Ref Student Charge to include student charge detail on the corporation account. Select Assign Students to Contract to initiate the process to assign students from the source contracts to the new contracts. Only students with an active status on the source contract will be selected. Select Check Term Activation if you want to only copy students who are term activated in the new term. 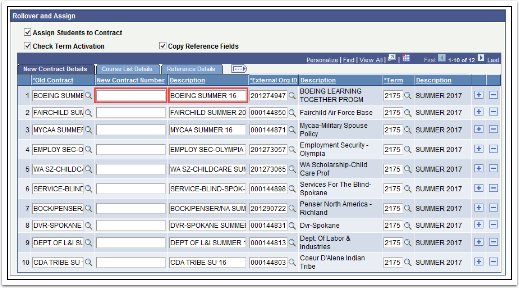 Select Copy Reference Fields if you want to copy the user-defined data from the source contracts to the new contracts. Click on Retrieve Contracts. This will return a list of contacts and contract details to be copied. Enter the New Contract Number and update the Description for each of the new contracts you will be creating. Click on Run and click OK on the Process Scheduler Request page. If you selected the Assign Students to Contract on the Rollover Contracts process, you will need to complete the following steps to assign the students to the new contracts. Select of enter a Business Unit. Enter the new contract number in the Contract Number From field. 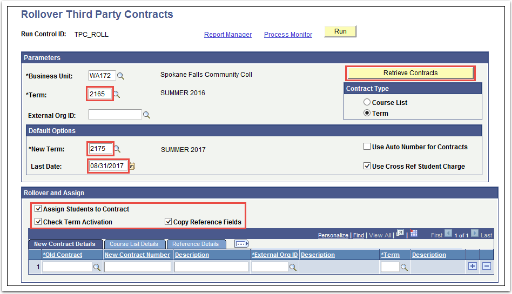 If you are assigning students for multiple contracts, populate the Contract Number To field with the last contract number of the range of new contracts you are assigning students to. Click on Run. 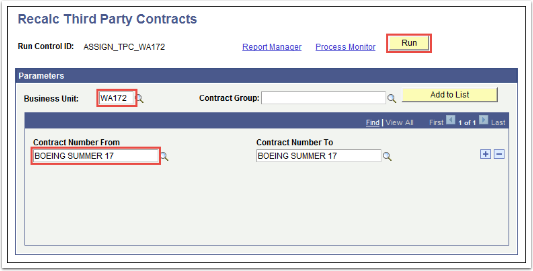 Select Third Party Batch Assignment from the process list on the Process Scheduler Request page and click OK.